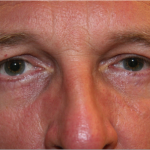 This information is provided to show you how bags under the eyes or excess skin near the upper eyelid can be remedied with a CO2 laser. Do not hesitate to ask your ophthalmologist for further information. The CO2 laser is located at the Belgian Ocular Laser Centre (BOLC) in Drongen. The CO2 laser produces a light beam located in the mid-infrared zone of the electromagnetic spectrum. This wavelength is invisible to the human eye so a visible target beam is used coaxially to treat the tissue. Carbon dioxide laser energy is to a high extent absorbed by the water in the tissue. This means that it can be used to perform an excision, make an incision, remove, vaporize and coagulate soft tissue. Laser resurfacing or laser rejuvenation is a treatment used to smooth out wrinkles in older skin. The CO2 laser produces a light wave which can heat up and evaporate tissue without damaging any of the surrounding tissue. The moderate heat radiation in the dermis below causes a rise in sub-epidermal collagen, resulting in lasting skin reinforcement. Some patients are not eligible for this particular treatment, e.g. : • People who have been taking Roaccutane during the previous 12 months. • People with a history of poor wound healing or who are suffering from keloid formation. • If a test patch has shown up excessive erythema, hyper or hypopigmentation. • If you were at any time susceptible to cold sores, we will advise you to take Zovirax 200 mg, 2 x 2 tablets a day, and to start this course 3 days prior to the treatment. You will have to continue taking this medication until your skin has healed fully. • If you have a dark skin tone, you will have to go on a hydroquinone course for about 4 weeks beforehand. • Prior to the treatment, retinoids may be applied locally as these are noted for their collagen-restorative properties. Straight after the treatment you will notice some erosion, a type of graze to the skin, which will be accompanied by slight swelling for the first few days. A few days later, you will spot a whitish-yellow fibrinous residue on the treated skin which will dry up and form a type of crust. After about ten days, the crust and flakes will gradually come away and the skin will once again be covered with epidermis. Following this initial healing phase, some redness will remain which may be concealed by Coverderm, a type of barrier cream which comes in the same shade as your own skin tone. 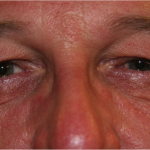 Several weeks later, the redness will disappear and you will have smooth, new skin. Not all lines will disappear, though; laughter lines will remain because they are set deeper into the skin. Laser resurfacing generally results in an enhanced skin texture. • Straight after the procedure, a barrier cover layer of Vaseline or Flammazine will be applied. You can leave this dressing in place until the next morning. During the first few days you may take a painkiller (Dafalgan effervescent tablets, up to 3 times a day). The objective is to ensure that the treated tissue is not exposed to air. • The day after the treatment you must change the Flammazine/Vaseline dressing and use icepacks to counter any swelling. You should keep your head slightly elevated when sleeping as this also counteracts swelling. You will need to soak the treated area in a mixture of cool water and white vinegar (1 soupspoon per cup of water) 4 times a day. • Day 2-10: You are free to shower and rinse the treated area with water and white vinegar. Apply Flammazine to the treated area 2 to 3 times a day. A crust will form which must come away SPONTANEOUSLY (around the 8th day). Afterwards, more Flammazine is applied. Avene Spring Water is a suitable alternative. You will have to apply this spray to the residue twice a day. • Day 10 until the 6th week: You are allowed to use make-up as soon as the crusts have come away. You may also use a hydrating cream. Avoid exposing your skin to the sun for the first month at all cost. Once the crusts start to come away your skin will be red. If you wish, you may conceal this redness with a Coverderm cream. • From the 4th week, you will need to apply sunscreen and retinoids. People with a pigmented skin will have to apply hydroquinone twice daily as a depigmentation therapy. 1. Pain: the procedure is performed under local anaesthetic, administered subcutaneously. Painkillers are prescribed if patients experience pain or itching during the first few days after the treatment. 2. Healing: the laser creates a superficial skin wound. This wound will heal within the space of ten days but is it vital that the crust and any fibrinous residue come away spontaneously and that patients refrain from scratching as this may lead to scarring. Once the skin has its new epithelial layer a certain level of redness will be noticeable for a while. 3. 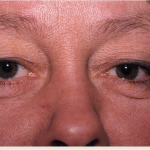 Pigment changes: both hyperpigmentation (excessive pigment) and hypopigmentation (too little pigment) have been reported. 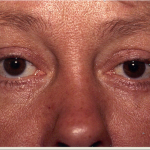 The former complication mainly occurs in people of southern (more pigmented) origin or following exposure to the sun. We recommend that you apply the strongest possible sunscreen for up to 6 months following your facial treatment. Hyperpigmentation can be treated very successfully with hydroquinone medication. Hypopigmentation occurs when the treatment is performed too deeply and the melanocytes (pigment-producing cells) are damaged as a result. This damage may be permanent. 4. 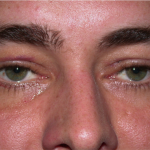 Swelling: straight after the treatment you will notice a certain swelling of the skin, especially around the eyelids. This swelling will disappear after 3 to 7 days. 5. Scarring: risks of scarring are negligible but can never be 100% excluded. Medical literature also mentions keloid formation (irregular fibrous tissue on the site of the scar). During the anamnesis you will be asked if you suffer from poor wound healing. The aftercare steroid treatment must be followed to the letter so that any of these problems can be avoided. The risk also increases in patients who have been taking Roaccutane to treat acne up to 2 years prior to undergoing a resurfacing procedure. 6. Eye injuries: during every laser procedure, your eyes will be protected by a metal shield. In this way, the laser beams cannot cause any damage to your eyes. 7. Infections: as laser therapy damages the epidermis, a barrier to infection falls away. Alarm signals are facial pains or delayed healing. In order to ward off any infection you are given a disinfectant cream after the treatment. Patients with a history of cold sores are prescribed Zovirax tablets which will also need to be taken beforehand. 8. 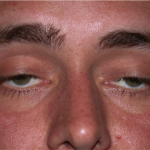 Ectropion: i.e., the inability to close the eyes while the lower eyelid turns outwards, can be a temporary complication of this treatment. This condition can be resolved surgically, should it prove to be permanent. 9. Laser resurfacing is not carried out during pregnancy. It is important to realize that the normal aging process of the skin will continue, even following this treatment. The results can be made to last longer with the help of vitamin-A-based skincare creams.